New! The HS1 is a high security heavy duty hasp & staple with bolt-through and fully-concealed fixings on both sides. It has Sold Secure approval, CEN4 rating and Police approval (under the ACPO Secured-by-Design scheme). The staple is hardened and the whole unit has been designed to suit the higher-security closed shackle padlocks particularly well, in addition to being compatible with a wide range of open shackle locks. And it is made in Britain! This page gives more information about HS1 hasp & staple. Customer Comment: "Just to let you know that the three HS1s arrived safely the other day. I am really pleased with them and the quality and fabrication is outstanding as always with your products." HS1 Hasp & Staple - What makes it good? It is much tougher than virtually all other hasps - Made out of 5mm thick laser-cut plates for the hasp and a 12mm thick laser cut staple, it is in a different league to most other hasps on the market. The staple is hardened, so it will provide a major deterrent to any sawing and drilling attacks. The hinge pin is welded top and bottom, to defeat pin-removal attacks. It uses 8 coach bolt fixings! Some use 1 or 2 or none! We have 8! Many other hasps rely on wood screws, so a thief can easily crowbar the screws out of the wood and gain entry. 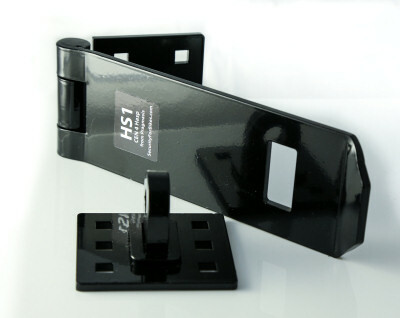 The HS1 is bolted through both the hasp and staple to defeat crowbar and levering attacks. The fixings are strong and concealed: As well as using 4 fixings on the hasp and another 4 on the staple, they are M8 and therefore stronger than most that use M6 fixings and they are fully concealed by the hasp when it is in the locked position. Hence, it is very difficult for a thief to attack. The photo above shows the hasp in its locked position and the bolt heads would be concealed in the thin gap between the plates. The 12mm thick staple fills the space under the shackle in many high security closed shackle padlocks, making it virtually impossible for a thief to attack either the shackle on the lock or the staple. It can be used with open shackle locks, but they are always a target for thieves and a closed shackle lock is strongly recommended. The shackle is vertical to allow closed shackle locks (such as the Squire SS50CS and SS65CS) to hang tidily. Many hasps have a staple that is horizontal so a closed shackle lock will not hang tidily and will poke out at an angle, making it easier for a thief to attack. We designed the HS1 to suit closed shackle locks from a security standpoint and also from an aesthetic standpoint - it fits and it looks good! It is suitable for a wide variety of shed and door designs. There are 6 pre-formed holes through the hasp mounting plate and another 6 holes through the staple mounting plate. You can choose which are the best 4 holes to use for each side, allowing for the framing timbers on the door and for the door frame. You don't have to use all 4 fixings on each side; the hasp is secure providing each side has at least two bolts fixing it. The absolute minimum would be a single bolt on each side, with perhaps wood screws (not supplied) through some other holes to help hold it firm. It can be fitted with DIY tools. It is Sold Secure Padbars Silver and CEN4 approved. This means it has been tested for bolt-crop resistance (3.5 tonne crop test), shackle pull tests (3.0 tonne tensile pull), as well as sub-zero shock and impact tests, drilling, sawing, etc. It is Police Preferred Specification - it has genuine Police approval and is suitable for credit points under the Code for Sustainable Homes initiative. The hole through the staple is 15mm internal diameter and thus large enough to take high security locks such as the Squire SS50CS and SS65CS. All our products are designed for easy DIY fit in a wide range of situations using only DIY tools. The instructions are written in a detailed, step-by-step way to guide you through the process of achieving a high-security fitting without needing exotic tools or advanced skills. You should generally be able to fit the hasp in about 30 minutes. Note that the HS1 Hasp & Staple is larger than many other hasps. This is deliberate, to allow sufficient concealed fixings on both hasp and staple sides and to allow the staple to be in a vertical plane, which allows use of closed shackle locks (as well as open shackle!). It is a heavy duty item that can help to boost the security of many sheds and similar structures. The staple is 12mm thick and the hole through it is 15mm diameter. Note that 12 bolt holes but only 8 bolts are provided - You can select which holes are most suitable for your shed and door configuration. All bolt heads are concealed by the folding plate of the hasp when it is in the closed and locked position. The diagrams above show the HS1 hasp with the hinge on the left and the staple on the right, but it can be fitted the other way round. The arrangement shown would commonly be used when it is fitted on the right side of a door, with the hinged hasp mounted toward the right edge of the door, and the staple mounted on the door frame to the right. Rotating the items 180° would allow it to be fitted on the left side of a door, for example. Vertical orientations are also possible, such as might be appropriate for securing a flap. Which fitting kits are available? The HS1 Hasp & Staple is supplied with a standard fitting kit, but with a choice of bolt lengths to cater for timber of different thicknesses. The contents of the fitting kit are shown to the right. The main fixings are M8 coach bolts, fitted with large penny washers, spring washers and nuts on the inside of the shed. Most sheds suit the standard 80mm bolt length but shorter and longer bolts can be supplied (longer bolts at higher cost). 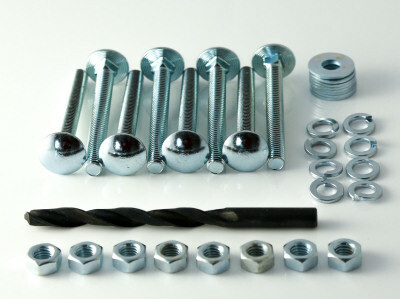 The package includes a full fitting kit and fitting instructions, together with all the relevant bolts, nuts and washers, and an 8.0mm HSS drill bit. There are lots of security devices on the market and it can be confusing to decide which ones are good and which ones aren't. One way of doing this is to ensure that any device you fit is tested by an independent organisation such as Sold Secure or accredited by the Police - the HS1 Hasp & Staple has both! The HS1 Hasp & Staple is available in our online shop, and also in a Package Deal with a recommended Squire SS50CS padlock, both at a bargain price!